Fill a large pot or dutch oven 3/4 full with water, (about 4 quarts). Add the salt and bring to a boil. Add the pasta and cook, stirring frequently, until al dente, 9-11 minutes. Meanwhile, cook the bacon and garlic in a large saucepan over medium heat, until cooked throughout but not too crispy, about 5 minutes. Drain most of the fat from the pan, leaving enough to coat the pasta, about 3 tablespoons. Drain, but do not rinse the pasta. Quickly break the eggs into your serving bowl and whisk them with a fork. Throw in the just-drained, piping-hot pasta and mix to coat. The hot pasta will cook the eggs. Then, toss in the bacon, garlic, and reserved bacon fat. 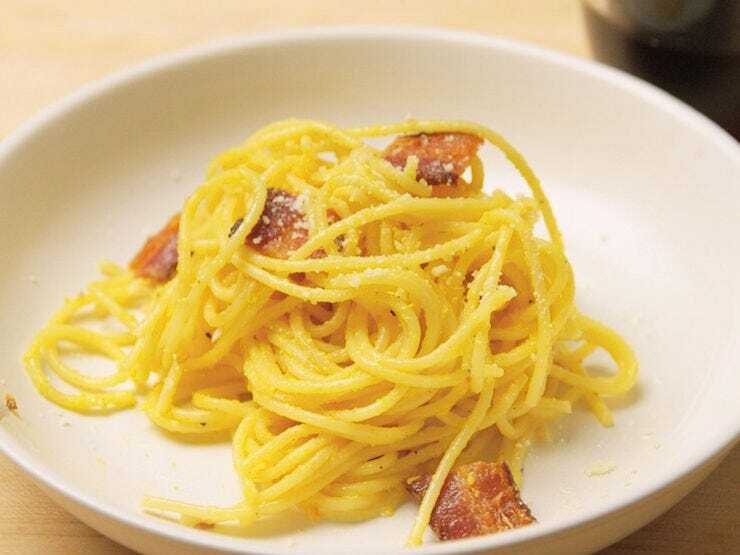 Stir in parmesan cheese, add salt and pepper to taste, and enjoy.